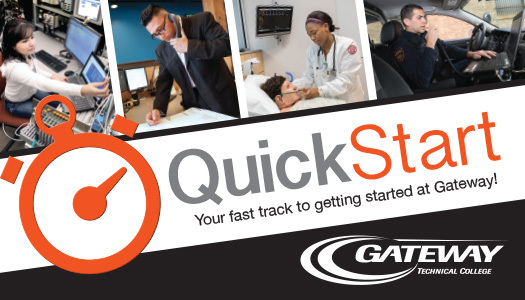 Those considering college face a number of questions as they seek to choose a program and enroll, and Gateway Technical College’s QuickStart event will help to make that process as smooth as possible. The event, held 11 a.m. to 5 p.m. Dec. 11 in the Student Life Center in the Lake Building (New Location) on the Racine Campus, 901 Lake Ave., will provide participants guidance on how to get started, select classes, apply for financial aid or determine career options. Any student who submits an application for admission will have their $30 application fee waived. Remember to bring high school transcripts, Accuplacer or ACT scores (or test at the session). Those who do can be admitted to Gateway at the event. Take the Accuplacer assessment. Students who wish to take this test must be on hand by 3 p.m. Learn about the resources available to students through the Gateway Student Support Services. Get assistance applying for financial aid. Go to gtc.edu/quickstart for a list of needed documents or for more information.